India generates approximately 150,000 to 200,000 tons of waste per day. This waste has now become unmanageable and requires a lot of energy and land to get rid of, through toxic processes such as incineration or land filling. Water is an irreplaceable natural resource that keeps our life alive and our environment. There are many water conservation techniques are being implemented around the world to save water. In addition, the alternative sources of energy other than fossil fuels are getting more focus worldwide aim to reduce the impact of climate condition. With a view to preserve these precious resources – water and energy, Airports Authority of India (AAI) has been following the Green Rating for Integrated Habitat Assessment (GRIHA). GRIHA is India’s National Rating System for Green buildings. It has been developed by TERI (The Energy and Resources Institute) and is endorsed by the MNRE (Ministry of New and Renewable Energy). GRIHA attempts to minimize a building’s resource consumption, waste generation, and overall ecological/ environmental impact by comparing them to certain nationally acceptable limits / benchmarks. It uses 5R such as Refuse, Reduce, Reuse, Recycle and Reinvent to access the various installations, as mentioned in GRIHA website. AAI Chairman Sudhir Raheja recently said that all proposed airports terminals under the Airports Authority of India would have GRIHA ratings as the airports management body looks tap alternative sources of energy and water conservation systems in a big way. AAI has already commissioned 4.5 MW rooftop solar power plants at Tirupati, he further added. SECI and AAI have signed MoU and completed 6.8 MWp roof top solar projects at 16 different airports/ units across India. 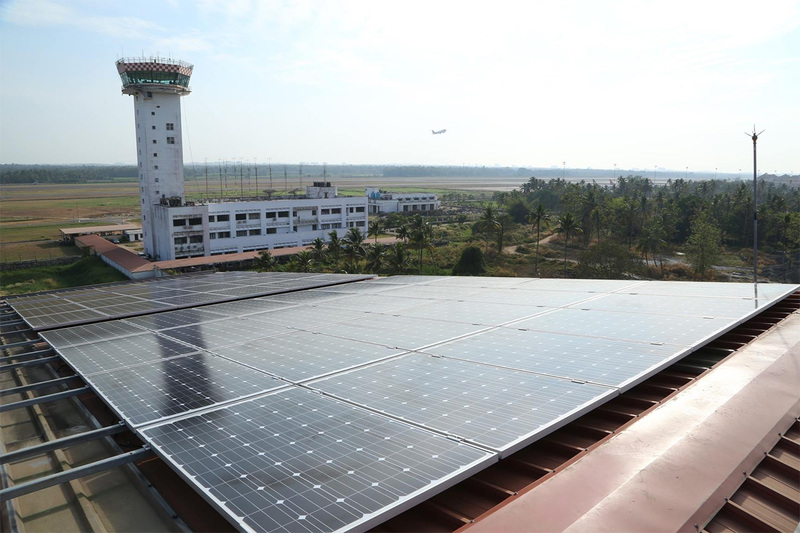 AAI further awarded another 2.9 MWp solar roof top plants & 19.8 MWp solar ground mounted works at 14 airports. Energy audit has been conducted at 42 airports in the year 2015-16 and 14 more airports are being taken up for energy audit in the year 2016-17. 15 airports were identified and taken up for replacement of conventional lights with energy efficient LED lights during the year 2015-16 and water conservation measures have been taken at 37 airports, reports Business Standard. Regarding water conservation system, recycled water is used for horticulture/firefighting/air-conditioning at 30 airports.